H. Rick Bamman - hbamman@shawmedia.com Aptar's Michael McDaniel (left) shows the results of a product pressure test to Kyle Gardner and Ryan Ruth during Manufacturing Day at the McHenry facilty. H. Rick Bamman - hbamman@shawmedia.com Prairie Ridge High School students from left Carson Getzelman, Cole Luehr and Zach Blakewell tour the Aptar facility in McHenry during Manufacturing Day. The annual event is designed to expose students to broad spectrum of careers in manufacturing. H. Rick Bamman - hbamman@shawmedia.com Prairie Ridge High School student Jessica Caravello watches the production line of bag-on-valves at the Aptar facility in McHenry during Manufacturing Day on Friday, Oct. 3, 2014. 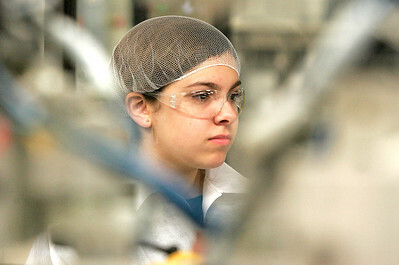 Prairie Ridge High School student Jessica Caravello watches the production line of bag-on-valves at the Aptar facility in McHenry during Manufacturing Day on Friday, Oct. 3, 2014.